Calvados is a member of the Black Organization. He was partnered with Vermouth. Upon arriving at Beika Airport, Vermouth calls him with orders to shoot a particular person once they are in his sight. Later he is called by Vermouth to stake out at the docks to help her kill Jodie after Vermouth (disguised as Jodie) had sent the FBI agents, who were originally hiding there to apprehend her, back. He shoots Jodie in the stomach and disables her and just as he was about to kill Haibara, Ran pops up from the truck of Jodie's car to protect Haibara. Calvados repeatedly tries to shoot her down (despite Vermouth's orders to stop) and misses, he stops when Vermouth shoots a bullet in his direction. Akai Shuuichi later breaks both of Calvados legs and takes his rifle, shotgun and 3 handguns. He later commits suicide in order to avoid being taken prisoner for questioning. 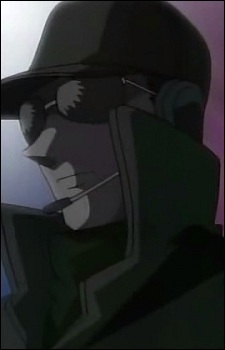 Calvados was one of many snipers hired for the Black Organization. He appeared to have had an infatuation with Vermouth, which Vermouth had used to her advantage. He also appeared to have had some sort of connection with other snipers such as Chianti and Korn. His favorite weapon was said to have been his shotgun.